Staircasing a shared ownership property is the process of purchasing part of a house or flat and then buying additional shares in the house when you feel you can to gain a larger percentage of ownership over time(FREEPHONE 0800 092 0800 to do this through us). Additional shares , or staircasing, may be done at any time in future years and with these additional shares being assessed on the property’s then value at the time of application. Also known as Staircasing Remortgages. Each time a shared ownership staircasing event takes place, the amount of rent is recalculated and reduces in proportion to your now larger ownership of your property. It should be noted that there is no compulsion to buy further shared ownership shares and the original share split can remain in place until the property is eventually sold. 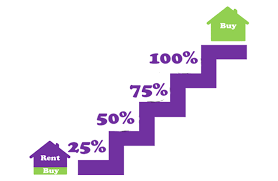 The price you will pay will be based on the current house price that the property you will partially own is valued at so it can go up and down, the value is set by an independent RICS-qualified valuer. If you staircase to 100% ownership then this is called “final staircasing” and when this happens you will become the outright property holder and are no longer a shared owner so no longer have to pay any rent. We have access to all Staircasing Mortgage Lenders for your shared ownership property and (subject to acceptance conditions) these are generally available for up to 95% of the share being purchased. For example on a property valued at £150,000 bought on a 50% share the initial shared ownership rent would be: £75,000 x 3% = £2,250 per annum, paid monthly at £187.50, therefore, the minimum personal deposit requirement could be as low as £3,750, although if a 25% share were purchased, this would reduce the shared ownership rent portion to £1,875. If you wish to sell your shared ownership home at a future date, the property is marketed for sale by the housing association and resold at the current market value.